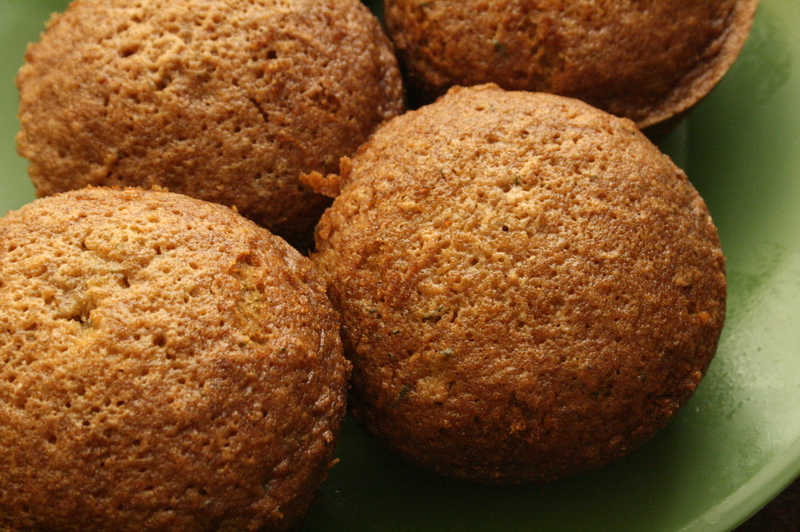 Zucchini Muffins - Kosher In The Kitch! Zucchini Muffins - Kosher In The Kitch! When this dish was served at a Shabbat meal several months ago, I was hesitant to have a taste since Zucchini was one of the ingredients. If it had been a kugel, then I would not have given it a second thought, but Zucchini cake? After my husband rolled his eyes I realized I was being childish and gave it a try. After that first bite, I had 2 slices! This recipe can be served as muffins, as a side dish in a loaf pan or for dessert in a bundt pan! It is fluffy and moist with a hint of cinnamon. 2 cups grated zucchini (3 small or 2 medium zucchini peeled) – BUT, YOU DON’T HAVE TO PEEL THEM – TASTES GREAT EITHER WAY. Blend the sugar, oil, eggs, and vanilla together. Ad all the dry ingredients and then add the zucchini last. Mix well.Bake at 350 for 50 minutes in 2 greased 10 ” loaf pans, or bake for longer in one bundt pan. (Bake it until it is browned on top and a toothpick comes out clean). For best results bake early in the week and FREEZE!! the Zucchini absorbs some water and when they thaw they are super moist and unbelievable!! I just made this for yom tov and its delicious! I’ve tried other zucchini kugels and the past and they’ve always came out tasteless but this came out great! This recipe has become my ‘go to’ dessert. I bake it in a bundt pan for a more elegant dessert presentation, but it works as a loaf, muffin, or even as mini-cakes (which I have done for Purim Mishloach Manos). It is a sophisticated recipe, and (I have discovered) it cannot be ruined! Overbaked or underbaked, it always comes out great. Freezes well too. I made these using spelt flour – was delicious! LOVE these muffins! Made it for a friend when we came over for brunch – her kids loved them too. I make it with 3/4 cup canola oil and 1 & 1/4 cup sugar. These muffins are great…make them many times,,,i only put in one cup of sugar instead of 2…and cut the oil down to 3/4 cup and it comes out just as good!